Bach was ever the practical musician, and whilst we know that his Masses, cantatas and Passions were not written with a continuo harpsichord in mind (for most of Protestant Europe during his lifetime the harpsichord was essentially a secular instrument, only permitted to be brought into churches in the absence of a functioning organ), and that he never used women's voices in those works, he would surely not have created too big a fuss when confronted with our acceptance, since the end of the Second World War, of such musical anachronisms as those in an attempt to approximate the kind of sounds he must have had in mind. 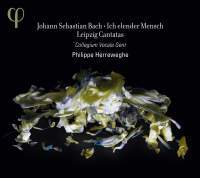 We even do our best to find the correct pitch at which music from that period should be performed, but we can never be entirely sure, and whilst, during , Philippe Herreweghe's long‑standing admirable commitment to Bach and his era, in his latest recordings ‑ as on this disc ‑ the Collegium Vocale Gent includes four women out of the 12 voices who make up the ensemble, but never a harpsichord. Bach may well have turned a blind eye, and a deaf ear, to the consequences of St Paul's admonition to the Corinthians: 'let your women keep silent in church', and applaud, as we do, Herreweghe’s overriding musicianship. It may be that with boys nowadays reaching puberty quite a few years earlier than they did 300 years ago, the chances of finding musically well‑trained, literate and sensitive boy singers capable of realizing Bach's soprano arias are well‑nigh impossible, so certain compromises have to be made in the name of art. We must support Herreweghe's practical solutions, and also admire his understanding of the scriptural message contained withine ach cantata, and how Bach transmuted that message into (often, very dramatic) musical ideas, most significantly in the matter of tempos. episode in Herreweghe's journey to record the complete Bach sacred cantatas, particularly BWV109, which, as Alfred Dürr commented, constitutes 'a kind of dialogue between fear and hope'. The tenor aria ‘Vie zweifelhaftig ist mein Hoffen' (How uncertain is my hope') is set by Bach to his most rhythmically challenging music, full of nervous agitation, with all doubt and calm resolution achieved in the equally great penultimate alto aria 'Der Heiland kennet ja die Seinen' (The Saviour knows those who are His'), followed by the lengthy chorale (and quoted by St Ambrose at the end of the Te Deum), underpinned by that unforgettable rhythmic ictus in the orchestral bass. As I have implied, Herreweghe's tempos throughout this astonishing masterpiece are superb, and we are rewarded by very fine solo singing from Thomas Hobbs and Damien Guillon, the French countertenor in particular finding a perfect resolution to Hobbs's equally fine depiction of human uncertainty. When that final chorale gets under way, as if driven from beneath, the sense of relief is almost tangible. This is a great performance, as is that of BWV73, which is finer than Herreweghe's earlier recording. In this work, the vocal demands are equally great, but different, as Bach overcomes several self‑imposed problems, principal being the chorale within the opening chorus against the flowing orchestration: Herreweghe's tempo once more is just right, enabling all aspects of this great music to be fully laid out before us, and the tenor aria excellently sung) has an almost Handelian sense in Bach's word­ setting. This work therefore poses different problems of interpretation, but the forces here are manifestly as one in their approach. Sie werden euch in den Bann tun, BWV44, as we might expect, is different still, yet wholly respectful of the text and its underlying message. The chorale given to solo tenor is a magical touch, and another Handelian (!) influence may also be traced in the vocal line of the long solo soprano aria – Dorothee Mields on excellent form ‑ prefacing the brief final chorale, though my earlier remarks about finding boys today capable of singing at this level of artistry brought to mind (and to my turntable) the astonishing Peter Jelosits in Gustav Leonhardt's Telefunken recording of this work almost 40 years ago. Ich elender Mensch, wer wird mich erlösen, BW48, opens the disc, a striking, seven­-movement work that Herreweehe manages to cohere admirably. It is rarely heard, but is made all the more valuable for the excellent solo singing of Guillon and Hobbs in their respective arias, Bach's musical implications of the wages of sin being not so much death as sickness, the tenor aria implying that the forgiveness of sins offers relief from sickness. The firm return to the G minor of the opening chorus, as here on earth, has resulted in a wonderful performance of a difficult score to interpret overall. Concluding the disc is an aria for five (solo) voices by Johann Schelle, 37 years older than Bach (Schelle died in 1701); further gratitude should be offered to Herreweghe for this relatively unknown gem, although the text is well known from Bach's great motet setting. Schelle was a predecessor of Bach at the Thomaskirche, and Bach very probably knew this setting. The performance here is surely exemplary, and the myriad recording balances posed by the varied works on this disc have been accomplished with skill by the engineers. 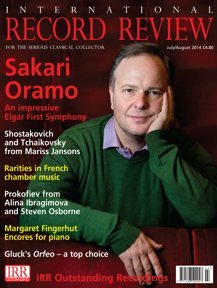 Admirers of this fine conductor will need no second bidding ‑ and those looking for a representative CD of Bach sacred cantatas can hardly do better than acquire this release, which is further enhanced by excellent booklet notes from Christoff Wolff, translated into good English by Charles Johnston.